Is my current school providing me with everything I want out of my college years? Can I afford to attend here? Are the support services what I need to succeed? Is this school the right fit for me? These are some of the questions students ask themselves when considering if transferring colleges is the best option for them. And if you are thinking of transferring, you’re in good company. According to a 2015 National Student Clearinghouse report on transfer and mobility, of 3.6 million students who began their postsecondary education in the fall of 2008, more than one-third (37.2%) transferred at least once within six years. In fact, 45% changed their institution more than once, highlighting the increasing trend of more students transferring schools while in pursuit of a bachelor’s degree. 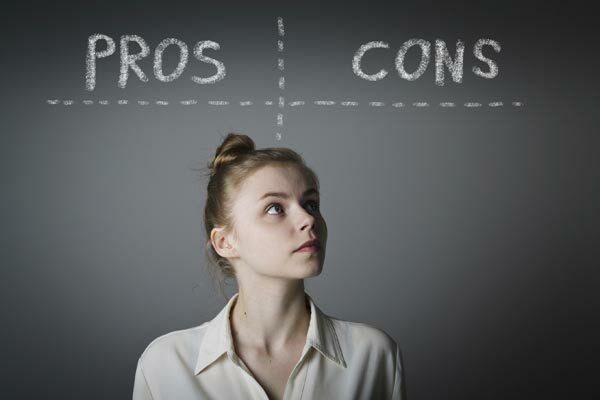 If you are interested in transferring to another college or university, there are several pros and cons to consider before taking the leap. Since you have made the transition from high school to college already, you have learned more about yourself and have experienced firsthand what you like and dislike about the college experience. Maybe your current college is too big or too small. Maybe there isn’t enough diversity on campus. Maybe you have decided to change majors and the school doesn’t offer what you now want to study. Or maybe you’re just homesick. In any case, transferring can offer you an opportunity to make the next school the right fit for exactly what you want. One of the most popular questions students ask is, “Will my credits transfer?” Sometimes, all of their credits transfer from one school to another—but often, they do not. How each college applies transfer credit upon admission is incredibly varied. For example, some classes might technically count for credit but not fulfill any of your specific degree requirements. This makes the transfer process tricky. To avoid being disappointed in the long run, ask your transfer advisor or admission counselor questions about whether or not your credits will transfer. Be proactive from the start and contact the school(s) you are considering and make sure you are taking transferrable classes and also finding out what grades you need to have in order for the classes to transfer. If you’re coming from a two-year college, check to see if there are any established partnership or articulation agreements between the two-year and four-year schools you are interested in. This might help streamline the process of transferring credits as well. The sooner you research a school’s credit policy, the better off you will be when it comes time to transfer. It can make all the difference in saving you time and money in the long run. Maybe you were not academically ready to get into the school of your dreams straight out of high school, or your test scores were not quite high enough for your top-choice college. Well, transferring gives you a second chance of getting into your first-choice school. Just keep in mind that you need to put the work in prior to getting there. Do well in the right classes and participate in extracurricular and community activities. These things will help you get into your preferred school, save you time and money, and help you be more adaptable when you decide to transfer schools. Putting your best foot forward from the start will benefit you when transitioning to the next school. One of the key difficulties of moving—even if you’re not going very far—is leaving behind friends and places you have grown fond of. But it is a reality of life that we all face at some point. Planning visits will help continue friendships, but relationships will naturally change or become strained by the distance. Strong friendships will last, while others may not. When deciding to transfer, consider the positive experiences and personal and intellectual growth to move toward your own personal and academic success. Whether you have decided to transfer from a two-year to a four-year institution or from one four-year institution to another, transferring can save you money while helping you meet your other college needs. Many schools also offer transfer scholarships and/or specific institutional scholarships that transfer students may be eligible to receive. For example, some colleges offer specific scholarships for students who are registered members of Phi Theta Kappa, a national two-year college honor society. Another factor to consider is overall financial aid. The financial aid package from one college to another might change depending on the type of school and how they award institutional aid. Similarly, attending a college closer to home might save you room and board expenses that you were paying at your previous school if you decide to commute. It’s not easy being a new student on campus. You might not know anyone. You could be placed with a random roommate. You will not be able to relate to the “remember freshman year” stories when hanging out with students who came in before you. This is always a challenge for transfers, which is why it’s important to think of transferring as a fresh start. Get involved with clubs and organizations on campus. Connect with other transfer students during orientation and/or transfer-specific events hosted at the school. Enroll in community service projects to expand your horizons. Join a study group. All of these options will help you establish new friendships and connections to your transfer college that you may not experience otherwise. At college you have already taken on the challenge of exploring new and exciting avenues and making new friends. Perhaps you even moved somewhere different, which forced you to live outside of your comfort zone and adjust to unfamiliar surroundings and people. Transferring schools will help you grow into a more independent person because you are repeating the process of pushing yourself intellectually and socially. When you become less fearful of taking risks or challenging yourself, you become more independent. You can’t help but gain maturity and crucial insights. Every college has it’s own culture. What is fun or popular at one school might be considered boring or rare at another school. You should consider what a school’s culture might be like when transferring. For example, city colleges will have access to many more nightlife activities for students such as restaurants and shows, while a rural college may not. Ask yourself what is important to you and why you want to transfer. The decision is different for everyone; only you know what is best for you. Transferring colleges is a huge decision and one that should not be taken lightly. In fact, in many ways, it is a bigger decision than when you picked your “first” school. But with the proper research, preparation, and consideration of the pros and cons, transferring could be the right decision for you and could set you up for future success.